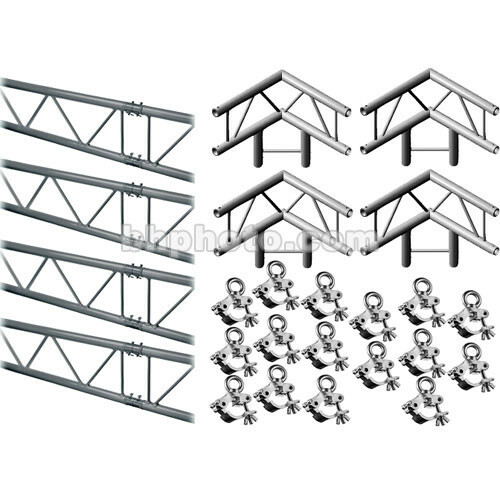 A Truss System is a modular aluminum frame that is used to mount lighting fixtures and audio equipment such as microphones and speakers over the performing area in the studio, onstage, or at trade shows. Depending on the anticipated total equipment load, a choice between a Milos QuickTruss DUO (2 Truss Tubes) or a TRIO (3 Truss Tubes) may be made. This Milos DUO QuickTruss M222 Hanging system offers great weight loading capabilities despite its small size and light physical weight. Considering this, the M222 is ideal for retail, trade show and decorative applications. When assembled, the truss members form a 10.8 x 10.8' square. When assembled with the included Cell Clamps, it is ready to be hung by your chain or rope, to the studio, club or convention center ceiling. The Milos QuickTruss M222 System offers great weight loading capabilities despite its small size and light physical weight. Considering this, M222 is ideal for retail, trade show and decorative applications. Connection is fast and simple, using a Conical Connector system with Pins and R-Clips (available separately). This is a 2500mm (8.2') 2-bar straight section. Order them in pairs for your custom configuration, or order one of the B&H kits available HERE. Connection is fast and simple, using a Conical Connector system with tapered Pins and R-Clips. All truss ends are fitted with precision CNC machined receivers and braced with horizontal end spars to provide a durable construction perfect for continuous use in harsh environments. The common connection method enables sections to be joined to any other components in the appropriate range without any problem, using your rubber or plastic mallet (Curve to Curve, Curves to Straight, Junctions, Base Plates, etc.). The Milos M222 Duo 2 Way Vertical 90° angle Corner is part of the QuickTruss System. Add this item in pairs while building a customized system, or expand an existing system. Made of lightweight aluminum, each exterior leg of this corner measures 1.3' (400mm). It includes a Connector Set. 8 x Milos Cell-103 Pipe Clamp, Bolt, Lift Eye - 1.25"
Cell-103 Pipe Clamp - 1.25" - part of the Milos QuickTruss System. It attaches to pipe diameters up to 1.25" (32mm). It has a M6 x 25 mounting bolt and round lift eye with bolt. 8 x Cell-103 Pipe Clamp with Lifting Eye - 1.25"
Box Dimensions (LxWxH) 98.0 x 9.5 x 4.25"
Box Dimensions (LxWxH) 15.2 x 8.6 x 1.1"
Box Dimensions (LxWxH) 4.0 x 2.5 x 1.3"